The men's rowing team sits on its boat after a GW Invitational race Saturday. Men’s and women’s rowing combined for 123 points to take home the Gilbert H. Hood Trophy in the 30th annual GW Invitational on the Potomac River this weekend. The award is given to the highest combined point total across both men’s and women’s competitions where the Colonials defeated second-place Drexel by four points. The men’s team tied for first with Navy in the Oliver T. Carr Bowl both with 78 points. The women placed fifth in the Howard W. Wilkins Bowl with 45 points – 23 points behind first-place Drexel. The men raced a perfect weekend, winning all six of its races to earn all 78 possible points. Navy ultimately won the Oliver T. Carr Bowl in a tiebreaker because of its faster Varsity 8 times. The two teams did not meet in a head-to-head race during the event. The result marked the second consecutive year in which the men’s team finished first in the regatta and third time in program history. Head coach Mark Davis said his team’s work ethic and ability to compete against the clock made the difference in close races. “They’re doing the right things right now to stay focused on themselves and what makes boats go fast and not worrying about anything else,” Davis said. 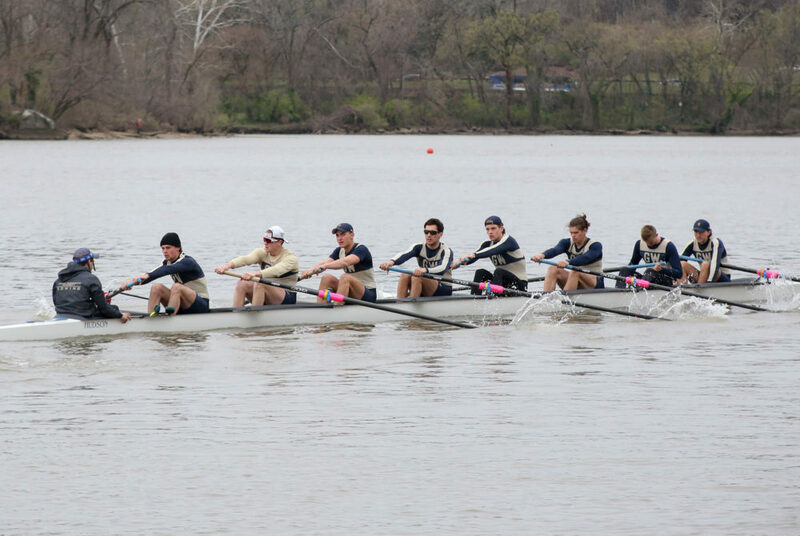 On Friday, GW took first in the men’s Third Varisty 8, Junior Varsity 8 and V8 races with times of 5:47.90, 5:39.10 and 5:36.60, respectively. The Colonials completed their sweep with a victory in the men’s V8 Saturday, edging the second place Michigan boat by just 1.30 seconds with a time of 5:40.50. Senior captain Maddux Castle said the team’s high-volume training in the off-season allowed them to perform well across the board this weekend. The men do not race again for another two weeks, when they will face off against Dartmouth and Brown in Rhode Island. Davis said the Colonials would use the time to tweak their lineups to find the fastest boats they can. On the women’s side, the Colonials’ result was three spots lower and five points less than last year’s result. The JV8 crew finished 18.5 seconds ahead of Georgetown and George Mason with a time of 6:32.40 Friday. The Colonials’ only other victory in the invitational came when the V8 bested Georgetown by a margin of 4.80 seconds and George Mason by 14.00 seconds. GW’s best time came in the JV8 race against Rhode Island and Harvard Saturday, where the Colonials finished 3.20 seconds behind first-place Rhode Island. Carcich said the invitational gave his team an opportunity to see how they stack up against tough competition about a month before the Atlantic 10 Championship. The women return to action next weekend at the Knecht Cup in Mercer, N.J.